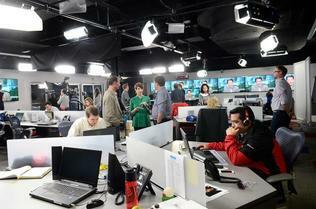 WJZY-TV, the Fox O&O in Charlotte, N.C., has taken a new approach to its newly launched 10 p.m. newscast. The show, which debuted about six weeks ago, forgoes a traditional anchor desk in favor of a table topped with video panels and the set is the station’s newsroom. “We were not going to do the traditional ‘voice of God’ behind the news desk,” Station Manager Karen Adams told the Charlotte Observer. Instead, anchors and reporters stand casually around the video table and discuss the news as handheld cameras capture the action — reality show style. More than two dozen large flat screens line the walls around them. The station uses Internet connections, rather than microwave trucks, to allow reporters to file stories, and stories can be longer than a traditional news package if the subject matter warrants. Read the full story in the Charlotte Observer.